As I have mentioned before, one of the things I immediately wanted to do in my classroom when we started our 1-1 Ipad pr0gram this past fall was find a way to have my students take quizzes and tests using their Ipads that gave them some immediate feedback and save me some time grading. While I still haven’t found that magical app that will do absolutely everything I want for absolutely free–or at least really cheap–I was presented an opportunity to take another stab at this particular wish this week. An administrator at my school recently asked me if I was familiar with the eClicker app. I said that I had installed it back during the summer, but I hadn’t really tried to use it that much, but would be willing to give it a try because I wanted to try out another app that was similar and pretty new to the app scene. So, I decided that I would put both Socrative and eClicker through a trial by fire in all of my English classes. 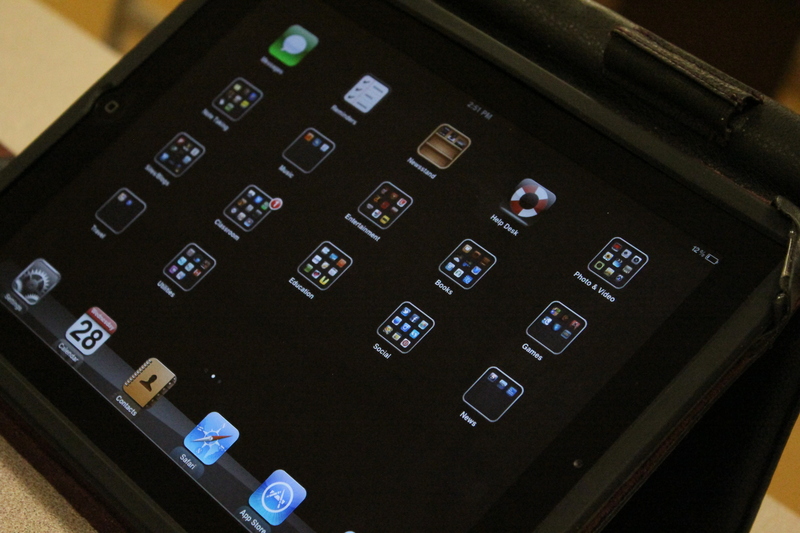 My plan of attack was to administer 2 quizzes to each class where they would use each app for one of the quizzes. While the quizzes weren’t the same, they did cover the same material. Both Require a Student App and a Teacher App: The student app for both only allow for responses to questions. The teacher apps allow for the creation, editing, and management of quizzes. I will say that when it comes to making the actual quizzes, it is much easier to do on a laptop. 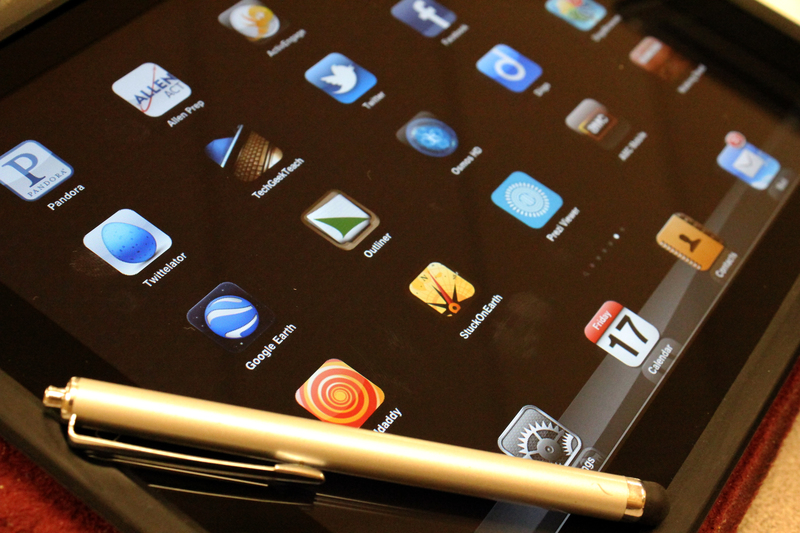 Both Utilize a Website: The websites for both apps store the quizzes and allow editing, creating, and managing. Both apps sync with the website so that the individual questions and question sets are consistent. Neither App Requires a “Server” Type App: This is pretty straight forward; once you have the teacher app and the students have their app, you are good-to-go–no need to install a server app on a laptop to act as a go-between since both apps work on your local wi-fi network. Both Allow for Categories and Tags: Being able to put quizzes into categories is pretty handy, but being able to put tags on individual questions is really helpful because you could build up a large question collection over time and use that to change things up on old quizzes or make new ones. Quizzes Can be Taken Using a Browser: Both systems allow students to take any quiz using a web browser–that is nice to have if a student doesn’t have his Ipad for some reason. Cost: While the student app for both is free, the eClicker teacher app costs $9.99. Socrative’s teacher app is free. Types of Questions: Both apps allow multiple choice questions. Socrative offers open-ended questions and eClicker does not. eClicker can put photos and drawings into questions which Socrative doesn’t. Socrative features a team game mode and exit ticket mode and eClicker doesn’t have either of these. Quiz Reports: eClicker reports can be emailed–but they are plain text files. Socrative will email reports that are in a spreadsheet and much easier to read. 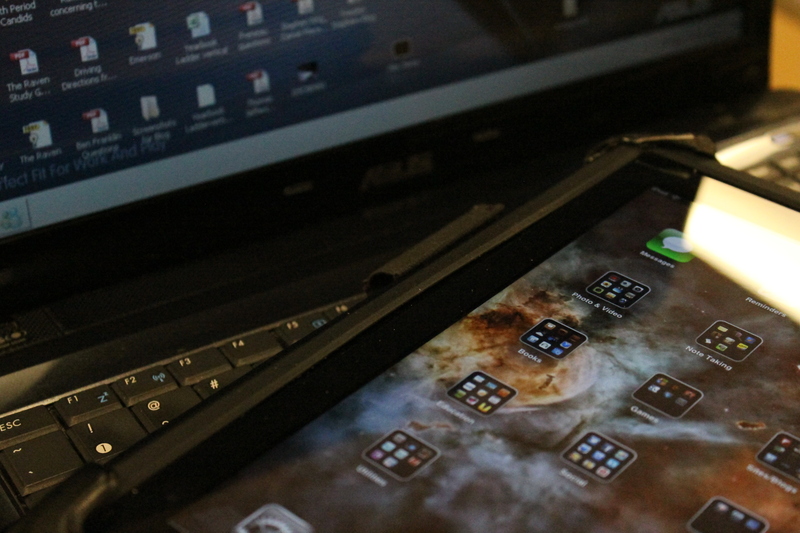 Running the Quiz: While both systems have a student and teacher app, Socrative will allow a quiz to be started from the website while eClicker’s quizzes have to be started from the teacher’s Ipad. This may be a factor in what I noticed about stability/reliability which id discussed below. Pacing: Quizzes on Socrative can progress according to a student’s own pace or by the teacher tapping the button to go to the next question. In eClicker the quiz questions change at a predetermined interval (which can be changed). Because the quiz had to be pushed from my Ipad, everyone had to be logged in and ready to go before the quiz could begin. With Socrative students didn’t have to wait on their classmates to login before they started. Stability/Reliability: This is easily the most important piece of the puzzle for me. If I am going to use any kind of system, it has to be dependable and rock-solid in terms of reliability. Socrative was clearly better in this category. eClicker was a problem in every single class because students would disconnect or the app would freeze. In one class we never got to the point where the students got to actually take the quiz with eClicker. Before everyone could get logged in and I could launch the quiz, half the class would disconnect. And when they reconnected, the other half would drop out. In the other 3 classes which actually started taking the quiz, 3 or 4 students would freeze or disconnect in the middle of the quiz. This was never a problem with Socrative. When I asked each class which app they liked better, they all chose Socrative–probably because of this one problem area. For what I want to do in my classroom, Socrative is the clear choice at this point. While it may not have absolutely everything I wished, it does enough that I can feel comfortable using it for some of the quizzes I give. Since it is a fairly new app, I hope that a future update will introduce the ability to include images with questions. I also really like the fact that it is totally free–I hope it stays that way. I also wish that eClicker was more reliable and that I didn’t run into so many problems with maintaining connectivity with the students’ Ipads. I really like having that picture option. But with so many students getting disconnected it presents too many headaches at this time for me to use it. I hope they fix that in the future. What Personal Response Systems or Smart Clickers do you use in your classroom? What system would you recommend? If you have used eClicker or Socrative what has your experience been? I’m just going to do a short post today because I am working on a couple of longer posts for Thursday and Friday. Over the last couple of weeks it seems that you can’t go too far while surfing around the internet without running into another announcement about a new site or Ipad app dedicated to educational videos. Seriously. It is no wonder that the concept of the “flipped classroom” is such a hot topic. While the amount of video players available for the Ipad would make for an impressive–and lengthy–list, here is a list of 4 of the most prominent, or promising sources for watching educational videos on the Ipad. The 3 apps and 1 website listed here are all free. 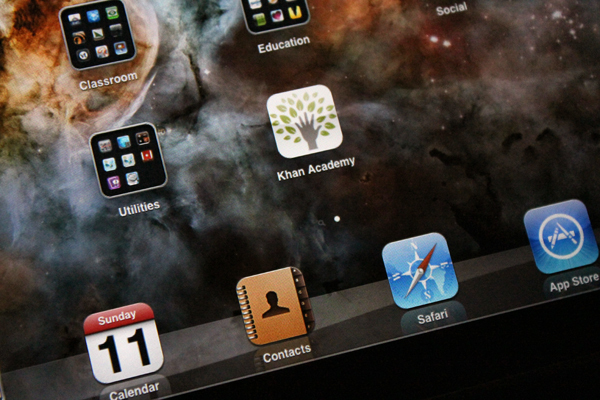 Khan Academy The increasingly popular education video site recently debuted its app for the Ipad in Apple’s App Store. Smithsonian Channel This app gives you access to streaming HD videos from the Smithsonian Channel. You can choose between featured videos or creating your own channel based around content areas that interest you. Some of the videos are short segments pulled from longer programs and some full-length videos of entire shows are featured. TED Great videos of some of the world’s leading thinkers in just about every field. Youtube for Schools Youtube has created an option for educators to use in the classroom that limits the content to educational videos while getting rid of the videos that gets Youtube blocked at many schools. Personally, I like using videos in the classroom because they usually grab the students’ attention. I have used videos for everything from King Arthur, to author biographies, to full films (when covering some basic film study with a college credit class). As much as I have used them over the years, I have always thought that I could use them better, or in a smarter way. But, access has always been a problem. Some options require having a subscription to a service while others required just buying the video outright. My hope now rests with the seemingly increasing number of free options making their way to the web or the app store. I should probably start investing some time into researching for specific videos that apply to my classes to use in the future. That will probably take some substantial time to do, but at least the future is looking is looking brighter for the options to choose from. What educational video apps or services do you use in the classroom? How do you integrate videos into your classes? What do your students think about the use of video in the classroom? 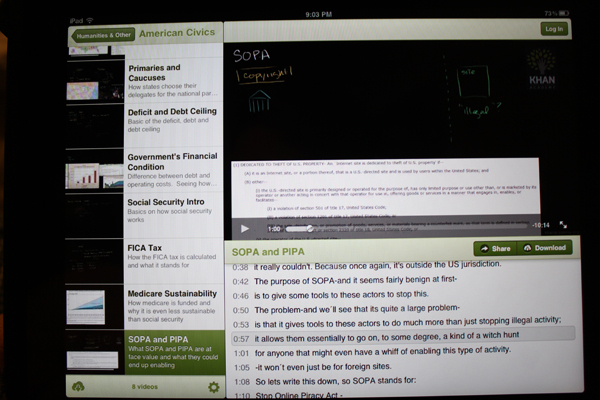 Sunday evening saw the release of the Khan Academy app for the Ipad. As soon as I ran across the announcement that it had been released on the App Store, I immediately installed it because I knew a lot of students and teachers would be interested in it. I wonder if it is a coincidence that the app’s release came on the same evening that Khan Academy was featured in a story on 60 Minutes? Probably not. As a teacher I find the whole idea of Khan Academy very exciting. There is no doubt that it is a great resource for students and teachers. It is also understandable to see how Khan Academy has really set a fire under the concept of the “flipped” classroom. As an English and Journalism teacher, I am bummed out that there really isn’t anything there for “my” subjects. Maybe that will change in the future–I sure hope so. But despite the lack of videos for English or Journalism classrooms, the app will surely be a major resource for many students and teachers when it comes to Math and Science–with some Social Studies thrown in there as well. 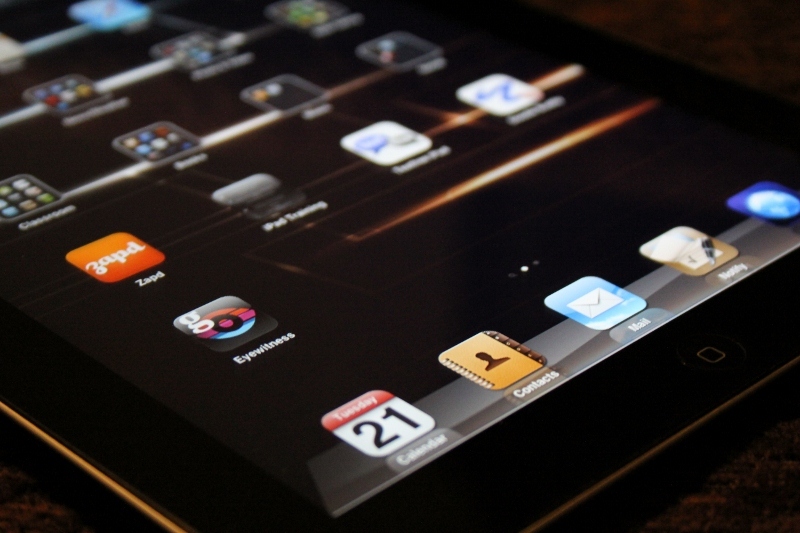 As for the app itself, the biggest benefit are that the videos are downloadable so students can save them on the IPad and watch them whenever–even if they aren’t connected to the internet. Another plus is that Khan Academy probably isn’t blocked at most schools like Youtube. I tried out a couple of videos after I installed it and it worked really well. The videos loaded pretty quick even over my not-so-great broadband card. I also liked having a transcript of the video’s contents on the screen which would scroll along as the video played. The controls are pretty easy to figure out and anyone who has played a video on the IPad shouldn’t have a problem figuring it out. Below is the screen as I was watching a video about SOPA/PIPA. Please excuse the quality but I can’t take screenshots on my IPad at the moment because when our school set them up over the summer the one for me was given a profile that locked out the screenshot function–and now no one can figure out how to get rid of the profile because it is encrypted. 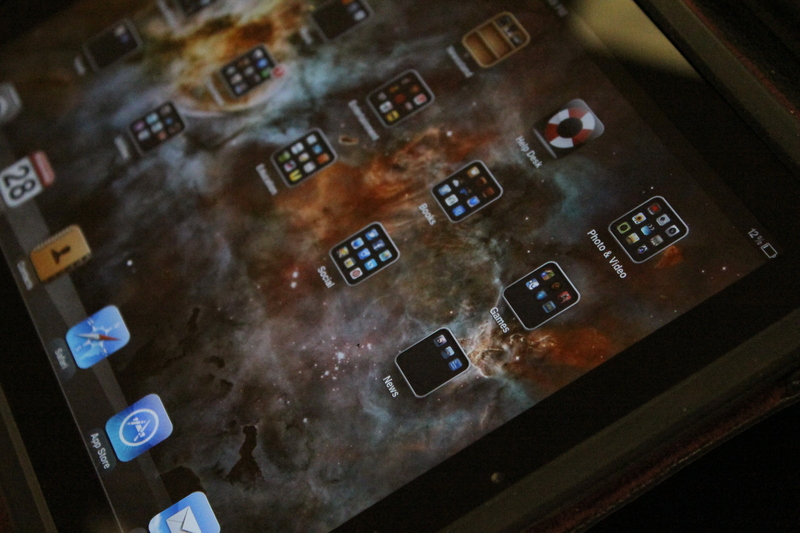 At this point it looks like I would have to do a full wipe of the IPad to get rid of the pesky profile. Under each of those there really are too many subcategories and videos to list here; but you get the idea. One weird thing i noticed when looking through all the categories and subcategories is that when you get to the Art History section and begin looking through its various listed eras is that there aren’t any videos actually listed. I am not sure if this is a bug or something to come soon. Overall I think this is going to be a great app for students and teachers which will only get stronger as they add to the number of available videos and functions for the app. If I was a Math or Science teacher I would probably add this to my list of favorite apps. If they do ever add some videos for English, Grammar, Literature, or Journalism, I may end up adding it then along with my list of apps I use in my classroom. What are your impressions of Khan Academy? What do you think of the app? What are some subjects you wish they would add?